This workshop explores, using HTM constellations to reveal the various old stories or patterns which we find ourselves held in. The process also shows the participants what resources, qualities and inner virtues are required to help them discard the old, put on the new, or to turn the page of their own book (of life) to move into a new narrative or continuing story. Very often, people re-play the same story, dialogue, complaint, state; they get stuck in the particular chapter. This work helps to facilitate changing the page. It could be said that each of us have three lives. For some, these three are quite separate, one obvious the other private, and one perhaps unknown or rarely experienced. For others these three lives run into each other constantly; intermingling, informing, being shaped. For the vast majority of people the three lives run parallel, and are not necessarily seen as a whole, neither reviewed, or reflected upon. The two halves are both inter-dependent, and on occasions, independent of each other. We suggest that these lives come from the differing halves of our brain; even though the two halves of our brain work inter-dependently, and independently. At a general level we could say that our left brain is our analytical brain; it puts order and shape into our lives, is analytical, time fashioned, structured, factual, literal and is the part of us that gives us a very ordered world view; pragmatic, down-to-earth and precise. 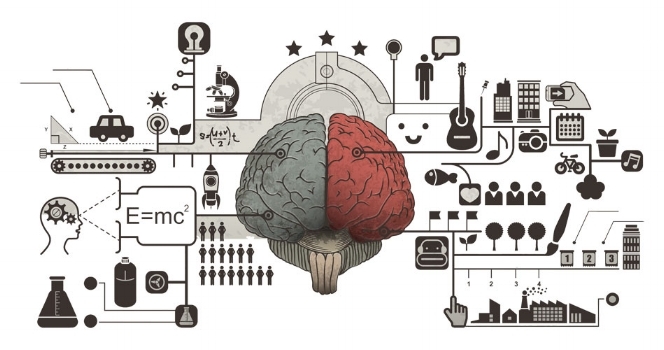 The right brain , although it works in tandem with the left, is our mythic or story brain. This part of us gives us a more expansive, non-literal, metaphorical, rhythmical, musical, lyrical view of our existence and place in the universe. During our life, these two brains both inform us literally and metaphorically. They help to give meaning to our life. The left helps us to learn, apply ourselves, to work, achieve and rise and succeed in our work. The right gives us a different approach to the left, helping us to have meaning in all things that we do, to help us to become master of our life rather than a person who passes through life. It is the story teller, and if the left brain gives us and allows us to remember facts of our journey, the right embroiders, magnifies, excites, teaches and is full of enthusiasm and hope, even when our stories are less than optimal. The third life, is what we call the inner life–a life within a life. It is our essence or soul, and which may or may not speak, guide or prompt us. It may be silent or active dependent on whether we have explored this inner reality. The soul guides the outer if it is allowed to, otherwise the outer self may shut down, temper, or silence the essence so we hear it not, nor are guided by it. It is the soul that communicates with the Higher Life forces, spiritual or otherwise. When we are guided by Grace then the descent of guidance becomes part of the narrative. When not, we often may find ourselves in stasis, floundering, becalmed, unable to move from our present predicament into another. We are unable to tun the page or chapter of our book. It was supposed, since the time of Aristotle, that we start with a tabula rasa (a blank slate) and shape and write the contents (of our minds, but in this context, our [own] book or story) throughout our life. as behavioural genetics indicate that certain inherited traits do shape the character and faculties of the mind, and that we have basic biological mechanisms. Never-the-less it is supposed that the basic programmability of the mind, ready at birth, allows us to input our own personal narratives even if the narrative adheres, generally or specifically to a larger model or archetype. Each different culture and language group will impose or allow differing archetypes and stories to become fixtures within each of us, as well as the old (inherited) narratives that have been past down through our genome. We are wired for social communication before birth, at around the 14th week in-utero, and this social need, helps us to inform ourselves of the 'other', of a larger world other than us, and of course, when newly minted, helps us to bond with our mothers. This predetermined social need infers that certain predispositions in personality or interaction with the other may well be dominant over one's own 'will'. Social interaction is about survivability, and makes us want to be part of a group. Group dynamics have their own flavor, nuances, characteristics and metaphorical symbology or iconic representation. These local groups–family, immediate environment, or larger groups as in clans, tribes, teams, general populace in towns, cities or countries etc.,–will have their own narratives, archetypes and stereotypes associated with them. These are what inform us in our archetypal patterns, and also in the broader context of the stories associated with these small or larger systems or constellations. Our soul may be the author of our initial clean slate, irrespective of our inherited proclivities, memes and epigenetic processes set in motion by family dynamics. When not, it is life circumstances that writes our book. This brings up the perennial problem between fate and destiny. Who is the writer, the author? In our ontological premise, it is that life writes the book when we are harried by fate, and our soul is the author when we are led towards our destiny. Using InnerDialogue's constellation process–the Human Template Model–we can uncover and reveal the story–the myth–that the person may be held in, and help them to resolve the pattern by finding what qualities, resources, virtues would facilitate their ability to move from the old to the new. 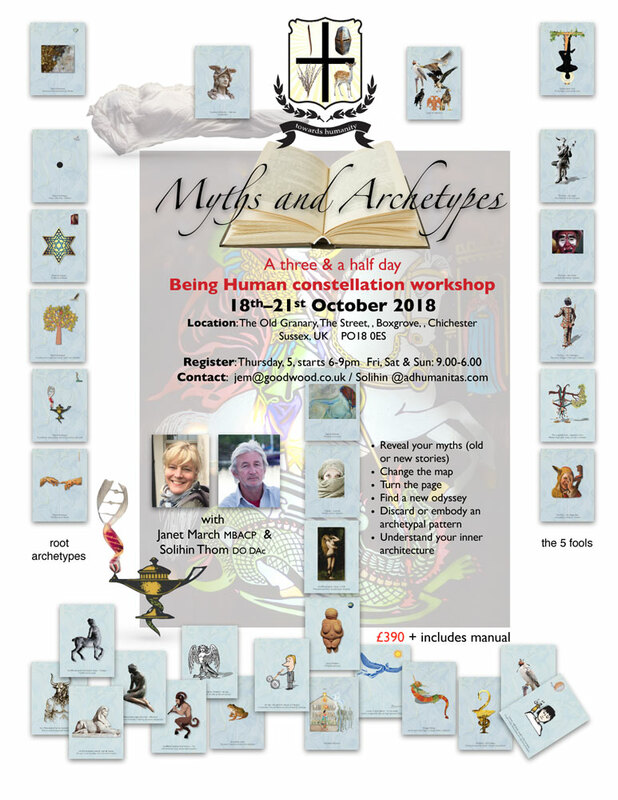 In similar way, archetypal pattern may also be revealed, not necessarily as myths (or old stories) but as characters which the person carries as part of who they are. In a similar way, these archetypes may be outdated, old, not very useful, and the constellation process allows them to see what are the contingencies that would help them to move from their present state. Further details will be posted this site as we get them. Prices, Local hotels, eateries etc.